126 years ago today on July 10, 1887, The Grand Hotel opened for business on Mackinac Island. 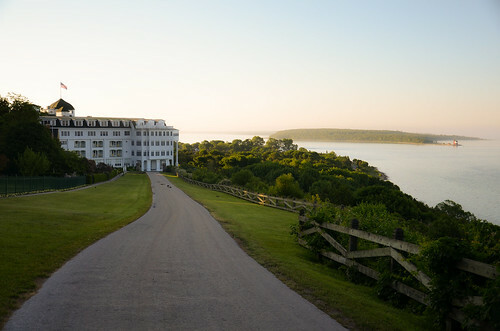 In honor of Michigan’s most famous hotel, here’s a seldom seen view. Check it out bigger and see more in MI photographer’s Mackinac Island slideshow. PS: The lighthouse you can see in the distance is Round Island Lighthouse – click the link to get closer with Michigan in Pictures. I highly recommend taking bike and visiting this section (West Bluff) of the island. In addition to a great view looking towards the water, there are some spectacular Victorian homes along this road. It also helped that this shot was taken around 7 AM before crowds. One of the photos in my set that you can see when you click through is a view of the hotel front porch in the morning light with hardly anyone around. Thanks for posting my shot. You’re welcome and thanks for the additional tips!